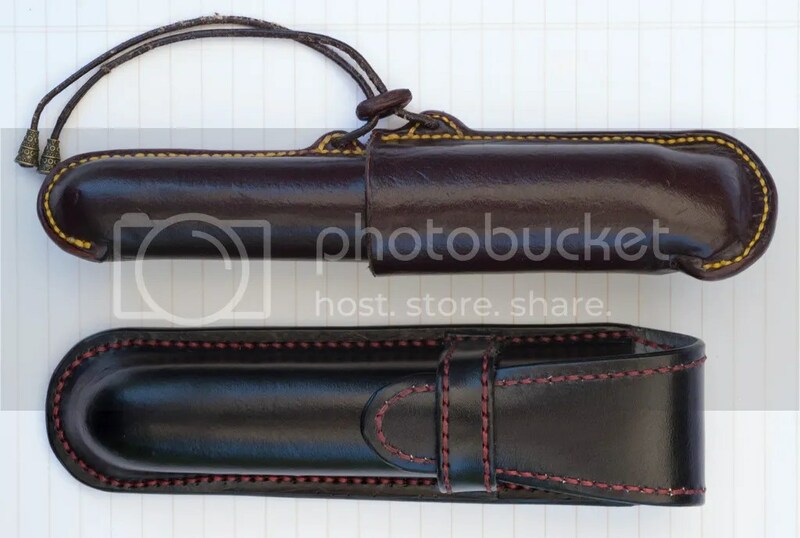 Through Fountain Pen Geeks Forum, I have gotten to know a fellow member MY63 — Michael — who does leather work including custom handmade pen cases. He very kindly surprised me with a single-pen case as a gift, and I liked that so much I bought a second in a different style. The first case is tubular in shape. It consists of two halves held together by a leather cord that closes with a leather toggle. Mine has a mahogany exterior with yellow stitching, and a tan suede interior. The second case has a more familiar holster design, with a leather flap that slips into a leather band. Mine is black with red stitching and a silver suede interior. I call it the Blackhawks case because I chose the colors for the 2015 Stanley Cup champion Chicago Blackhawks hockey team.